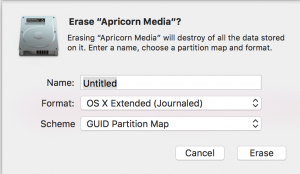 In the case of Mac acquisitions, it is best to have the destination drive formatted to OS X Extended (Journaled). The steps below have been done using the El Capitan operating system, so they will look slightly different than older operating systems. Take your destination hard drive of choice and plug it in to your computer. By “your computer”, this does not mean the machine you are imaging. 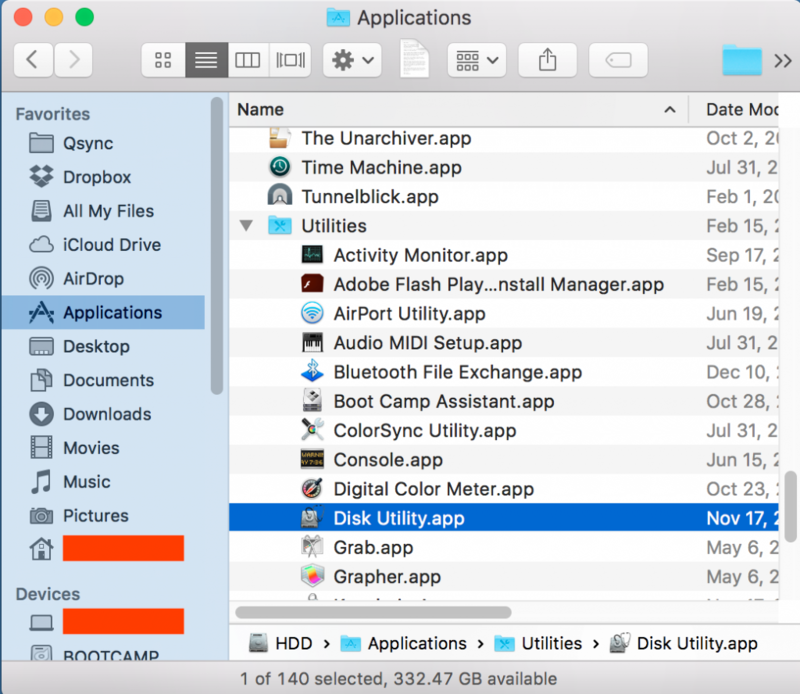 Open a Finder window, and in the left column, select the Applications folder, and in the right pane, expand the Utilities folder and locate the Disk Utility App, as shown below. Double click to open the Disk Utility, and you will see the window below. As you can see, the physical hard drives appear in the left column, and under them, indented, are the logical partitions. In the example, the destination drive was formatted for Windows, so a logical partition is not visible. For preparing the destination hard drive, select the physical drive in the left column, as seen below, then click on the Erase button as circled below. You will now see a box appear as shown below. The Name field can be anything you wish it to be. For reasons that only experience can teach you, it is preferential to select a short, single word for a name. In the Format field, you want to select OS X Extended (Journaled), unless you know of a reason to pick something else. Under the Scheme field, select GUID Partition Map. Now click on Erase. The formatting process will start, and you will see the progress as shown below. After a brief period of time, typically measured in seconds, the formatting will be complete, and you will see the box below. Now that the formatting is complete, click on Done, and you will be back at the original screen, but the new drive name and partition will be visible as shown below. You can close the utility above. Back on your Desktop, you should now see an icon indicating the new destination drive, as shown below. 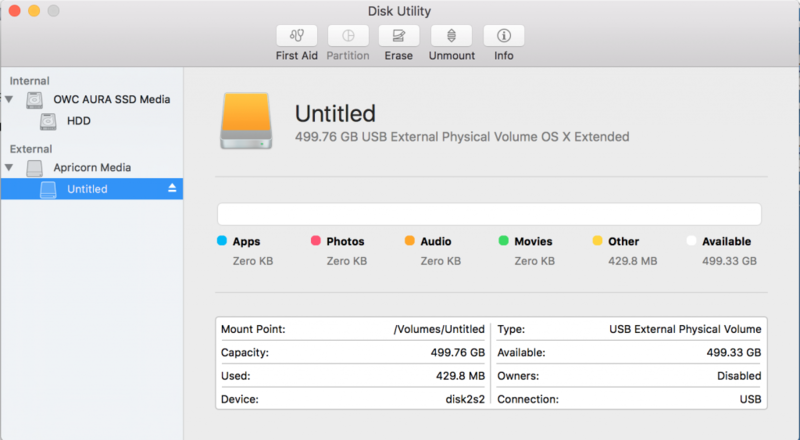 Do not simply unplug the new hard drive, or you risking damaging the partition. 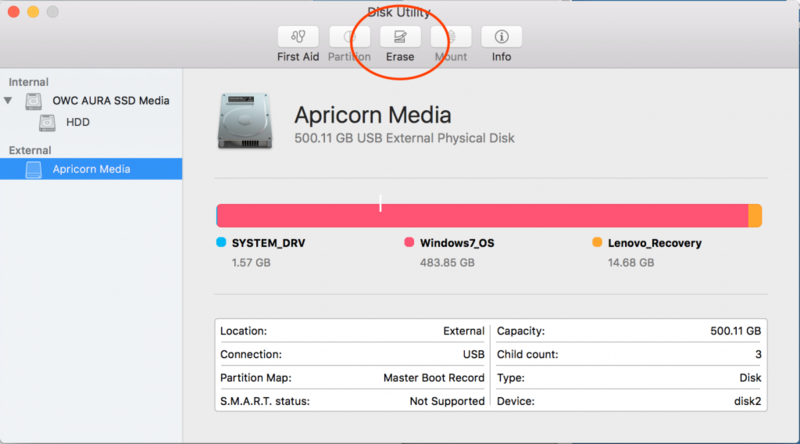 You should always right click on the icon, and select Eject, as seen below, and then you can unplug your drive AFTER the icon disappears. Your new drive is now ready.